How do you make the act of thinking exciting without relying on ‘Sherlock’-style graphics? That’s one of the questions this film has to handle. ‘The banality of evil’ was a phrase created by Hannah Arendt as she tried to come to terms with the crimes of Adolph Eichmann. Margarethe Von Trotta’s morally complex film covers the German-Jewish political theorist/philosopher’s trip to the Jerusalem trial of Eichmann in 1961, to write a series of articles for the New Yorker, after the huge success of her book studying the Nazis’ place in 20th century history. Arendt soon sets the cat among the pigeons by refusing to offer up a sacrificial victim to those seeking a simplistic damnation of Eichmann. She sees what nobody else understands; that he is a slave to obedience, a thoughtless bureaucrat blind to the concepts of guilt and conscience, denying himself any humanity. Real footage of the trial is cut into her story with great fluidity. Arendt’s earlier relationship with Heidegger is also explored – it must be remembered that Heidegger was accused of anti-semitism – but this feels at times like a separate subject for study. How much of Arendt’s theorising was to do with her own rigorous personal philosophy, or was she was acting as the voice of reason in an atmosphere of vindictive hysteria? (Don’t forget that this was within living memory, and therefore a far more volatile subject). As Arendt loses friends by sticking to her guns, one starts to wonder whether her affair with Heidegger ultimately compromised her thinking. The answer, to her credit, is no, not at all. At the root of this drama is a simple question; is evil conceived in a vacuum? Arendt is trying to understand how Europe can have fallen under the spell of Nazism. But she goes further, asking whether Jewish leaders were doing enough during the Holocaust, and this proves a step too far. Did she appreciate that you criticise Jewish leadership at your peril? There’s an electrifying scene where blindly pro-Jewish journalists tear apart her reputation, only to be slammed down by Arendt’s supporters reminding them that Arendt was herself in an internment camp while they were playing intellectual footsie. Arendt’s mistake was to provide a philosophical answer to an emotional question at a time when feelings were still raw and new. There was nothing in the statute books that could even begin to cover the Nazi war crimes – this was all virgin ground. 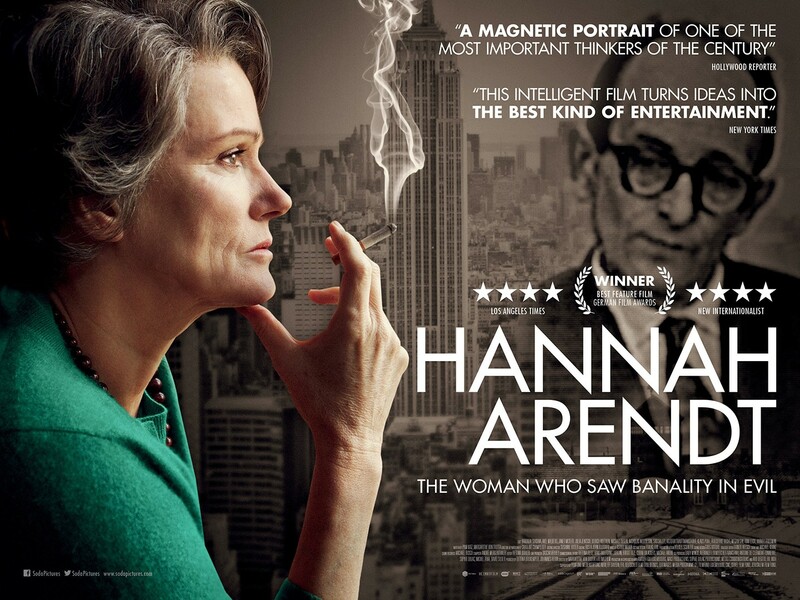 Barbara Sukowa, playing Arendt, conveys the carefully moderated thinker with coiled tension and elegance, and for a film about divisions of philosophical thought, manages to present complex ideas simply and without condescension. Can such a film prove entertaining? Well, there’s nothing ponderous here, and Von Trotta has gone to great lengths to ensure that we understand her subject. More than that, she makes the journey as enthralling as any blockbuster (or rather, more so). The film has divided the critics in exactly the same way that Arendt divided hers. But what surprises me is how few critics have made the connection to the film’s relevance today. It is impossible now to have a serious conversation about extremism, whether we are talking about Gaza or Syria, without coming up against deaf ears and blind hysteria. In a week when a Scottie dog managed to offend Malaysian Muslims at the Commonwealth Games, it seems that religious extremists are shouting down and shutting out any intellectual thought. Arendt comes over as a riveting character, explaining her reasoning as she hammers through the snouts – I’ve never seen so much smoking in one movie. Her closing speech had me on the edge of my seat. It’s an extraordinary award-winning film about a fascinating woman. Do see it. Indeed, there is faction among Jewish leaders to brand anyone critical of their actions as being an anti-Semite: the quicksand of debate on this important subject.